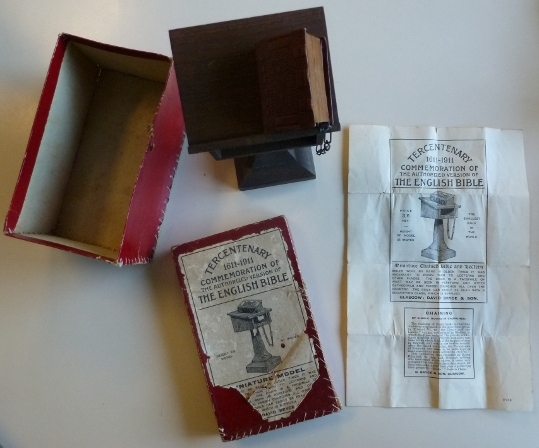 This time, A. brought another most precious artefact dating back to 1911, the smallest Bible in the world, edited for the tercentenary of the authorized version of the English Bible and its supplied magnifying glass, chained to a small lectern, as well as the following flyer, which we read together. We were all impressed as well by its hand-sewn box from her grand-mother. The chaining of single books in churches doubtless originates in the Injunctions given by Edward VI to the Clergic and the Laietic in 1547, and printed by Grafton, in which they are ordered "to provide within three months next after the visitation one boke of the whole Bible of the largest volume in English, and within one twelve moneth after the saied visitacion, the Paraphrasis of Erasmus the same to be sete uppe in some convenient place within the church." This Injunction was repeated by Queen Elizabeth in 1559, and although nothing was mentioned about chains, it seems very probable that the Churchwardens would, for their own sake, adopt that plan of protecting their property. William Blades (1824-1890) was an English printer and bibliographer. Erasmus did publish several biblical paraphrases of the Gospels in Latin, in the first half of the 16th century. Ch. brought her sudouest-magazine about plane-trees and spoke about their deathly sickness. C. spoke about her 14 month son and his day-care center. It was an opportunity to talk about bilinguism in families, and early immersion in foreign languages. We had a very interesting conversation about brain-training and memory (audio, visual or acting). Everybody agreed to listen to recordings in English (free audio books by librivox) : next tuesday, Jataka tale of the timid foolish rabbit.